Discover a simple, direct approach that highlights the basics you need within A FIRST COURSE IN THE FINITE ELEMENT METHOD, 6E. This unique book is written so both undergraduate and graduate students can easily comprehend the content without the usual prerequisites, such as structural analysis. The book is written primarily as a basic learning tool for students, like you, in civil and mechanical engineering who are primarily interested in stress analysis and heat transfer. 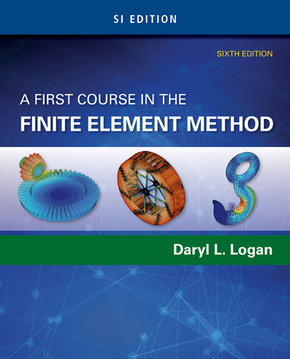 The text offers ideal preparation for utilizing the finite element method as a tool to solve practical physical problems. Brief History. Introduction to Matrix Notation. Role of the Computer. General Steps of the Finite Element Method. Applications of the Finite Element Method. Advantages of the Finite Element Method. Computer Programs for the Finite Element Method. 2. INTRODUCTION TO THE STIFFNESS (DISPLACEMENT) METHOD. Definition of the Stiffness Matrix. Derivation of the Stiffness Matrix for a Spring Element. Example of a Spring Assemblage. Assembling the Total Stiffness Matrix by Superposition (Direct Stiffness Method). Boundary Conditions. Potential Energy Approach to Derive Spring Element Equations. 3. DEVELOPMENT OF TRUSS EQUATIONS. Derivation of the Stiffness Matrix for a Bar Element in Local Coordinates. Selecting Approximation Functions for Displacements. Transformation of Vectors in Two Dimensions. Global Stiffness Matrix for Bar Arbitrarily Oriented in the Plane. Computation of Stress for a Bar in the x-y Plane. Solution of a Plane Truss. Transformation Matrix and Stiffness Matrix for a Bar in Three-Dimensional Space. Use of Symmetry in Structure. Inclined, or Skewed, Supports. Potential Energy Approach to Derive Bar Element Equations. Comparison of Finite Element Solution to Exact Solution for Bar. Galerkin's Residual Method and Its Use to Derive the One-Dimensional Bar Element Equations. Other Residual Methods and Their Application to a One-Dimensional Bar Problem. Flowchart for Solutions of Three-Dimensional Truss Problems. Computer Program Assisted Step-by-Step Solution for Truss Problem. 4. DEVELOPMENT OF BEAM EQUATIONS. Beam Stiffness. Example of Assemblage of Beam Stiffness Matrices. Examples of Beam Analysis Using the Direct Stiffness Method. Distribution Loading. Comparison of the Finite Element Solution to the Exact Solution for a Beam. Beam Element with Nodal Hinge. Potential Energy Approach to Derive Beam Element Equations. Galerkin's Method for Deriving Beam Element Equations. 5. FRAME AND GRID EQUATIONS. Two-Dimensional Arbitrarily Oriented Beam Element. Rigid Plane Frame Examples. Inclined or Skewed Supports - Frame Element. Grid Equations. Beam Element Arbitrarily Oriented in Space. Concept of Substructure Analysis. 6. DEVELOPMENT OF THE PLANE STRESS AND STRAIN STIFFNESS EQUATIONS. Basic Concepts of Plane Stress and Plane Strain. Derivation of the Constant-Strain Triangular Element Stiffness Matrix and Equations. Treatment of Body and Surface Forces. Explicit Expression for the Constant-Strain Triangle Stiffness Matrix. Finite Element Solution of a Plane Stress Problem. Rectangular Plane Element (Bilinear Rectangle, Q4). 7. PRACTICAL CONSIDERATIONS IN MODELING: INTERPRETING RESULTS AND EXAMPLES OF PLANE STRESS-STRAIN ANALYSIS. Finite Element Modeling. Equilibrium and Compatibility of Finite Element Results. Convergence of Solution. Interpretation of Stresses. Static Condensation. Flowchart for the Solution of Plane Stress-Strain Problems. Computer Program-Assisted Step-by-Step Solution, Other Models, and Results for Plane Stress-Strain Problems. 8. DEVELOPMENT OF THE LINEAR-STRAIN TRIANGLE EQUATIONS. Derivation of the Linear-Strain Triangular Element Stiffness Matrix and Equations. Example of LST Stiffness Determination. Comparison of Elements. Derivation of the Stiffness Matrix. Solution of an Axisymmetric Pressure Vessel. Applications of Axisymmetric Elements. Isoparametric Formulation of the Bar Element Stiffness Matrix. Isoparametric Formulation of the Plane Quadrilateral Element Stiffness Matrix. Newton-Cotes and Gaussian Quadrature. Evaluation of the Stiffness Matrix and Stress Matrix by Gaussian Quadrature. Higher-Order Shape Functions. Three-Dimensional Stress and Strain. Tetrahedral Element. Isoparametric Formulation and Hexahedral Element.